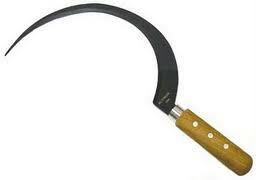 A sickle, used for harvesting grain crops, is not the shape you want your foot to be in when dancing! ACKNOWLEDGMENTS: I so appreciate my lovely students, Emily, Sophie, and Irena, for agreeing to model both the incorrect and correct positions for this blog! Thanks, you guys! Today’s topic is probably the most common fatal flaw among dancers. 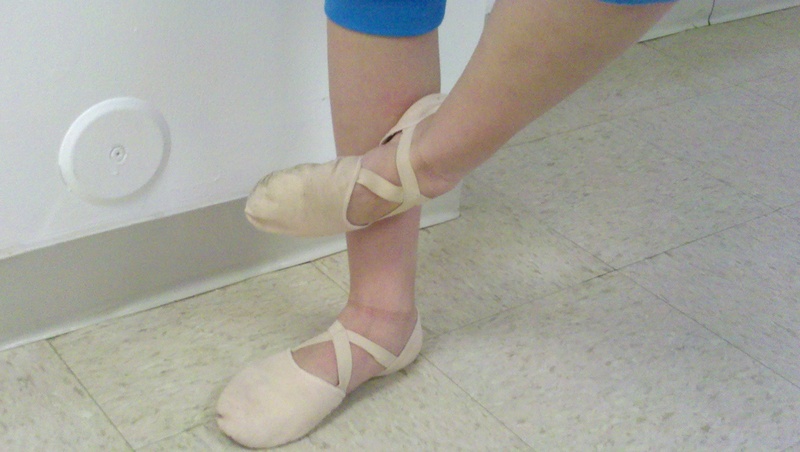 Sickled feet are probably one of the ugliest mistakes a dancer can make on stage and, unfortunately for the dancer, it is readily noticed by the judges. To any dance professional, seeing a sickled foot is like hearing fingernails run down the chalkboard. Picture this from the view of a competition judge: A new young dancer takes the stage. She enters with a couple chaînés, and then settles into a B+ to wait for her music to start. If that back foot in the B+ is sickled or turned in or both, she just lost MAJOR points for her technique score and she hasn’t even started dancing yet! If she keeps up the sickling throughout her routine, especially on those steps which are the most sickle-prone (arabesque, tendu, attitude, or on the passé foot in pirouette, she will continue to lose points every single occurrence. 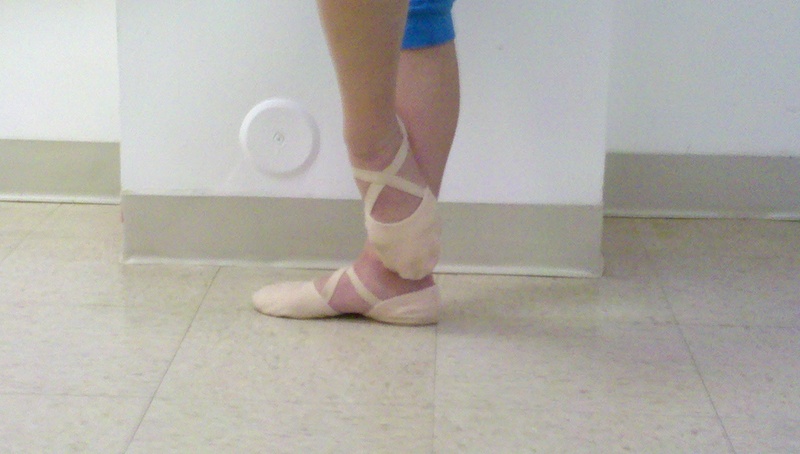 Not only are sickled feet hideously ugly to dance professionals, but they only act to get in the way of the dancer. Try to imagine dancing pigeon-toed, for instance. You’ll fall all over the place! So, how do we fix sickled feet in dancers? I have found that the first step in ridding a dancer of the habit of sickling their feet is to take the time to make sure that the student understands what you mean by “sickling.” Make them do it! Actually make them sickle their feet and then make them correct it. Then, again, make them sickle, and make them correct it so that they can develop a sense of the control they have over their own ankle and foot. Second, I ask the dancers to stand facing directly to the side of the studio so that they can see themselves in profile in the studio mirrors. I then ask them to place the foot closest to the mirror into sur-le-cou-de-pied at the ankle of the supporting leg. Sur-le-cou-de-pied is a French term translated into English as “at the ankle” (the phrase “cou-de-pied” literally translates as “neck of the foot,” which is the French term for “ankle”). In this position, they place the heal of the working foot directly up against the shin of the supporting leg and then wrap the working foot around the supporting ankle so that the big toe comes to wrest around the back of the ankle with the toes pointed as much as possible. Sophie in sur-le-cou-de-pied, with her heel in front, toe wrapped around to the back. This is the shape we are striving for. I tell the students to remain in this position for quite a while and ask them to memorize what it feels like to have the heel pressed that far forward and the toes pressing back. Then, from sur-le-cou-de-pied, I have them take that working leg, without moving a single muscle in that foot, and ask them to extend it into tendu, often front, side and back, all the while having the dancer watch themselves in the mirror to make sure that the foot not only doesn’t fatigue and go into a sickle, but also that it stays in that elegant and beautiful “anti-sickle,” as I call or it, or, as I also refer to it, as the sur-le-cou-de-pied foot. Many of my students experienced an “oh wow!” moment the first time I tried this exercise and they commented on how pretty of a shape this is. Irena in tendu forward, maintaining the heel-forward shape from her sur-le-cou-de-pied. Sophie, maintaining the sur-le-cou-de-pied shape as she extends in tendu, creating the lovely heel-forward look. I do this in every technique class, and, once you have a term for the correct shape of the foot that the dancers can recognize, it becomes easier to correct it later on in class. And you MUST insist on them correcting sickled feet whenever they occur. Eventually it will become second-nature and they will begin to experience the nails-on-chalkboard sensation when they notice other dancers sickling their feet! 1. Remember that the teacher loves dance. And they expect you to, as well. I’ve yet to meet a dance teacher who isn’t completely passionate about what they do. They do what they do and are willing to put in all the long and exhausting hours, both in the classroom and out of it. They definitely don’t do it for the big bucks, but because, for many of them, dance is their life. I would daresay that dance teachers are most often used to making large and deep sacrifices on behalf of their art. You can rest assured that they will give you everything they’ve got and then some. As wonderful as that is know about your teacher, don’t forget that that means they are likely to not be understanding with people for whom dance isn’t everything. Those of us who grew up dancing and doing nothing else have missed countless weddings, funerals, birthday parties, and other functions throughout our lives. We completely understand that important things come up in our students’ lives, but we expect the students and their parents to prioritize. By all means, if you have to miss class to take your SAT’s, I will wish you all the luck in the world and insist you prepare for those! However, if you miss something important such as a stage rehearsal, or a final rehearsal before competition, your teacher is unlikely to understand, no matter what the reason is. I had a student once miss the only stage rehearsal for our finale because of a First Communion in her family, and her mother informed me “I’m sorry, family comes before dance.” My response was, “I’m sorry, if she misses the rehearsal, she is not as prepared as the other students and therefore, cannot be in the finale.” Regardless of how good your excuse is, if you’re not there to learn what you need to learn, you’re not going to be able to do it on stage. That’s the reality. 2. Dance is different from most service industries. Thankfully, I’ve never been confronted with a dance parent stating that “The customer is alright right.” If I were, I think I would respond with, “Well, you were mistaken…” Dance is different from many other service-based industries. In fact, I would think of a studio as an educational institution like a school or college. Yes, you are paying to attend, but by enrolling, you are also making a commitment to perform the work that is expected of you and to follow the rules. After all, how much are you going to get out of your dance education–or any education–if you don’t put any effort into it? If you enroll at a univesity, but refuse to show up for exams or turn in your papers, it doesn’t matter how much you’re paying, they’re going to throw you out. After all, why would you spend all that money to do something you’re not going to take seriously? The same concept is true in dance. Instead of expecting the studio to cater to you because you pay the bills, think of it as if you are paying for a unique opportunity and it is in your own best interest to make the most of it and work as hard as you can. Your educational experience at the studio will be all the better. 3. Follow the rules. Yes, you. Since young dancers often have the same teacher for years and years, close bonds can form, both between the teacher and student and the teacher and the student’s parents. Hopefully, your studio feels like a big extended family. But, just because you feel close to your teacher and feel they are an important part of your lives, that doesn’t mean the teacher’s rules don’t apply to you. Rules like dress codes, and rules at competitions and recitals, are meant to be followed by EVERYONE. 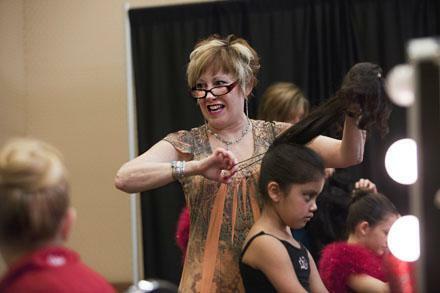 For example, at recital time, teachers agree to follow the rules of the facility where we are holding the show. If they insist on no food or drink inside the theater, that means it becomes OUR duty, if we ever want to hold a recital there again, to enforce those rules. Don’t assume, “Oh, Jesse knows we will be careful.” Don’t risk the entire studio losing their performance venue over Powerade or pizza. The rules are there for a reason. If you are close to your teacher, then the best thing you can do is to set an example for the other dance families. 4. Resist second-guessing the teacher’s artistic choices. The same applies to costumes. Your teacher will have a very good sense of what is expired and what is over-used. Oftentimes, what a student or parent thinks is just “gorgeous,” actually just isn’t. Remember, the judges at competition are dance professionals, and your teacher is more likely to have a handle on what their opinons might be. I don’t mean to discourage anyone from offering suggestions to your dance teacher, but if they don’t agree, there is probably a good reason and it is best to just accept it and trust their judgment. 5. Be open and honest with your teacher but choose your battles. If there is a problem or if a student feels uncomfortable with anything at the studio, I’m sure your teacher or studio owner will want to know. We want the dance experience to be wonderful for everyone! But here are some suggestions. First of all, don’t drag your teacher into studio drama or gossip. If a parent or student comes to me and says “Oh, I can’t be in that class with so-and-so, we don’t get along.” I’m very likely to respond with, “Ya know what, I don’t have time to worry about teen drama, so you’re going to figure out how to get along.” Believe me, we don’t appreciate being dragged into feuds, and we know when we are being played. Trying to turn a teacher against another student (and it happens!) is not going to end well for you. Be very careful what you “complain” about at the studio. Dance teachers tend to be very confident and strong-willed people and you’re setting yourself up for a bad situation if you begin a conversation with anger or resentment. The best way to approach a dance teacher is carefully and respectfully. Be careful not to become labeled a “problem parent.” If you’re routinely complaining or upset and the teacher begins to dread seeing you come in the door, you may, in fact, be ruining opportunities for your child. Since dance teachers often give up their own time for extra practices, or even to create extra teams or other special projects, and if they consider you a “problem parent,” they are likely to leave your child out of special things. While teachers never want to punish a student because of the actions of a parent, you are more likely to get special opportunities and roles by being a “delightful parent,” rather than a problem one. In moments of crisis and when things go wrong, it’s easy to let the adrenaline take over and lose control. It happens often in the high-stress world of competition dance and during performances when adrenaline is running high anyway. You are more likely to resolve the situation smoothly and avoid any further complication by remaining calm, thinking of a reasonable solution, and professionally executing it. Many relationships between teachers and students have been compromised or soured because of heated moments when things were said without thought. While the fights among parents of Abby Lee’s studio might be entertaining on TV, they actually act only to hurt the students and no one wants that. Stay calm and dignified, no matter what goes wrong. Clearly, these tips were written from the perspective of a teacher and studio owner, but I want to assure all dance parents that their teacher has their students’ best interests at heart and we want all of them to succeed. These are suggestions that will be sure to make the dance experience the best it can be for everyone involved.